Tauranga: festival hub! Part I escape! 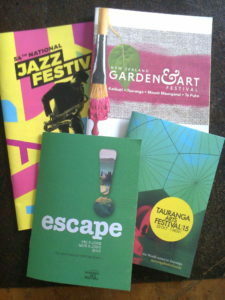 You are at:Home»BEEN & SEEN»Tauranga: festival hub! Part I escape! You may never have considered travelling to Tauranga for “cultural events” or if you’ve just moved here from bigger and busier parts of New Zealand read on and discover the calibre of events hosted here. There’s a regular cycle of festivals in and around Tauranga, Bay of Plenty. A genteel and organised pattern has developed which sees major events appearing in alternate years. 2016 is the year of the Garden & Art Festival which, as the title suggests, pairs a variety of stunning and interesting gardens with the work of local artists. In the other year we have the Tauranga Arts Festival a great effort by one of New Zealand’s smaller (but expanding) provincial “towns” bringing both the much love and the downright unusual to the community. While there’s great territorial authority financial support for Tauranga festivals there’s extensive involvement from local charitable organisations and commercial entities. There’s also extensive participation by community volunteers who with “the professionals” get these events to fly. Queen’s Birthday Weekend 2016, that last long weekend frolic for some New Zealand Winter and Matariki months, saw escape: the little festival with big ideas! Happening in Downtown Tauranga, escape is the little brother of the major Tauranga festival effort – Tauranga Arts Festival which will be back in 2017. ARTbop contributors Diane Hume-Green and Marcus Hobson both took advantage of their downtime to participate in aspects of escape. Marcus has titled his experiences “A thrilling escape!” so here we go with the intrepid Mr Hobson…. The Tauranga festival that promoted itself as “the little festival with big ideas” certainly lived up to that billing. Famous names from the world of literature packed out the Baycourt Theatre and audiences went home with plenty to think about. As we approached the theatre on Sunday morning, people were leaving the first session of the day talking excitedly and debating what they had heard. 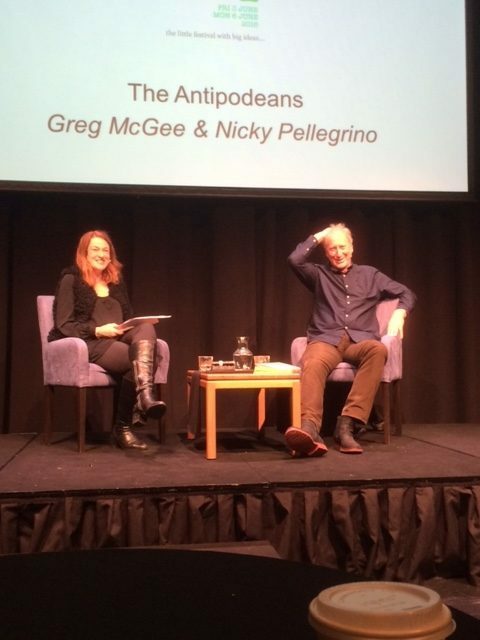 Our first session was a lively hour of discussion between Nicky Pellegrino (latest book Under Italian Skies) and author of The Antipodeans, Greg McGee. He turned out to be a highly engaging character, full of life and certainly full of stories. 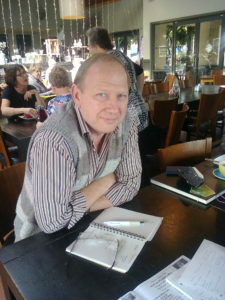 He is that unlikely mixture of a successful rugby player who went on to become a lawyer and then on to become a writer. Every element has given him wonderful stories to tell and he regaled us with hilarious tales of his time coaching rugby to Italian sides near Venice. The local dialect was so different to the Italian he was struggling to learn that for a while he was calling his whole team “flowers” instead of the local word for boys. I’m not sure if I was the only person in the audience who didn’t know that Greg McGee had also written two successful crime novels under the pseudonym Alix Bosco, but that is the fun of these events, learning stuff you didn’t know. Turns out that Greg’s agent used to start giggling when he rang, not sure if he was talking to Greg or Alix and if Greg would be wearing a dress. Greg feels that now her secret is out of the closet that he may not be able to write another novel as Alix, but I hope he does. I enjoyed the way that Greg was able to flit between his writing styles, and explore the differences of writing novels, or writing for TV where you have to put your characters under pressure so that they reveal their true desires. This is obviously not like books where you spend a lot of time in characters heads. On the strength of what I heard I bought a copy of The Antipodeans, since Books a Plenty were on hand to sell me a copy, and I could get it signed by the author. Second up was the wonderfully knowledgeable Dame Anne Salmond, who fascinated a packed house with stories of how she got into Maori studies. Having gone to the United States as a Field Scholar, she realised that she knew almost nothing about her national heritage. She was lucky enough to listen to JFK in person speak to the visiting scholars on the White House lawn. I love hearing people tell stories like that, when they were part of something that now for us is history. Anne Salmond is a tremendously charismatic lady who went to study for her doctorate in Anthropology at Cambridge (at the same time as raising her children). She is an expert in the Maori world, fluent in Te Reo and her love of the subject shines through. As she told stories of well-known figures from Maoridom with whom she worked and learnt, I could tell that she feels it is important for her to pass on the learning from these figures. Now she not only writes, but also is actively involved in conservation and education. She spoke passionately about the need for inspiring teachers and supportive parents to motivate children to excel. In recent years she has begun to champion our waterways as living forces and speak about the need to keep them free from pollution. As she rightly points out, water from underground aquifers can take 80 years or more to flow out. If we have been poisoning these with chemicals for the last fifty years we may not yet even know what damage we have caused. I could have gladly listened to Dame Ann for hours and allowed her to get into detail about some of the projects she is passionate about. It is good to know that a champion like this often works with some of our biggest corporations on matters of environment and education. If anyone can help Air New Zealand to be the greenest airline in the world, I am sure Anne Salmond can. 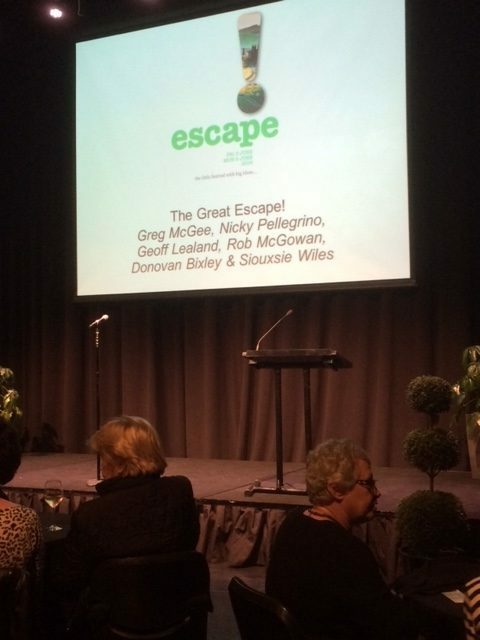 The final Act for us at our Sunday of escape was a story telling feature, called appropriately “The Great Escape”. Six of the festival speakers gave us the benefit of a short seven minute piece from their life, their work or their imagination. Nicky Pellegrino talked about coming to New Zealand with the aim of finding a husband and being introduced to someone squeezed into what she described as a “sausage suit”. Donovan Bixley narrated the dangers of drunken toga parties where being wrapped in the same sheet as someone else is not always ideal when trying to use the lift. 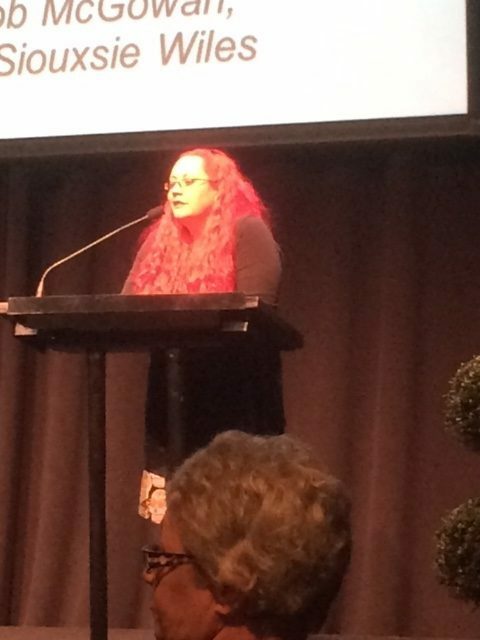 Pink haired scientist Siouxsie Wiles gave us a history of helpful bugs, every one of which that was the next great thing and then stopped working. Geoff talked about his love of film and also New Zealand’s little cinemas. Conservationist Rob McGowan talked about what he has learnt about the healing properties of our native plants and made the wonderful comment that the world will live without us but we cannot live without the world. And finally Greg McGee again had the audience rolling around with laughter as he described childhood and growing up in Oamaru. His father’s view of punishment for trying out a bit of teenage shoplifting was to enroll him in singing practice, the church choir and boxing classes to keep him out of trouble. It seemed to have the opposite effect, with hilarious consequences. A quick taste of just three of the escape Festival’s many events. If I had but more time (and money), I would have gone to more features. The one man Shakespeare performance, No Holds Bard, by Michael Hurst was apparently stunning. The concept of Macbeth telling Hamlet that he would have made a better Dane sounds wildly inventive and amusing. Elsewhere Peter Gordon taught us how to cook and The Human Library opened eyes to a completely different type of performance. Well done to escape Director Claire Maybe and her team for putting on such a wonderful event. Let us hope that popularity continues to grow year on year, seats all fill up and we can have another great festival next year. This wonderful combination of words and images by Marcus Hobson, ARTbop’s Literary Editor is also published online in ARTbop in his column Hobson’s Choices section of WORDS. Author Nicky Pellegrino was interviewed by Claire Mabey at a morning tea at Baycourt as part of the escape Festival held during Queen’s Birthday weekend. Spongedrop Cakery provided an Italian themed morning tea as an accompaniment to Claire talking to Nicky about her latest novel, Under Italian Skies and also some of her previous novels As a journalist Nicky makes a living from writing, but embarking on novel-writing was a new experience all those years ago and she never though she would write more than one novel, let alone nine. Nicky grew up in England, daughter of an Italian father and English mother, with holidays spent with relatives in Italy. This experience made for many memories to use as inspiration for her books. Nicky recounted her holidays in Italy were not at a glamorous resort but sharing a room with other family members and being part of everyday life in Italy. The women in her novels are based loosely on women she knows or knew and the Italian settings are from new and old visits to Italy. From her childhood memories she used a real house as the Villa Rosa in one novel and a visit in recent years to a cookery course as a basis for her novel set in a cooking school. Claire asked which place she loved the most in Italy. Nicky replied that would be Rome which is an amazing city but a visit to Venice should be on everyone’s to do list. She intends returning to Venice and a top travel tip is to get up early and beat the tourists and just walk around looking at the architecture. Time spent in Sicily was very interesting and as food plays such a large part in her novels, she enjoys watching the preparation of and tasting delicious Italian food. Claire asked about some characters who have been in more than one novel. Nicky said she often has a restaurant or another place pop up as well as characters who come in and out of some novels, sometimes unexpectedly. 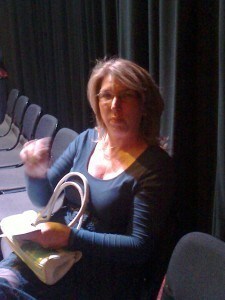 Nicky has a great sense of humour and tales of her husband and father and life in Italy had the audience in stitches. Questions from the floor included asking how she works time wise, if she is going to write a cookery book and who inspired her glamorous older woman character. Books a Plenty had a table laden with Nicky’s novels and she signed them at the end of the talk. 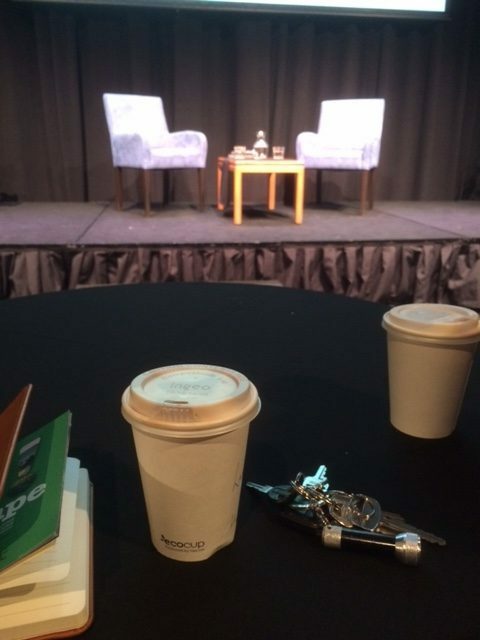 An hour went by very quickly and it would have been nice to have had another coffee and chat about books in general with the other audience members up in the Baycourt Foyer. The foyer had been transformed amazingly by The Incubator and really set the scene for whisking us away to sunny Italy on a winter’s day in Tauranga. Diane’s article is also published in her column Scene about Town in the Reviews section where you’ll find other examples of Diane’s participation of the cultural life of Tauranga. Previous ArticleARTbop: what’s up and what’s coming up!